As you drive south on I-15 from Las Vegas towards Los Angeles, the view is serene. Save for a few lonely cacti, the desert extends in all directions until it meets brick-red, scraggly hills. This picture-perfect scene goes on for miles until... what is that peculiar thing in the distance? Like a yellow phoenix rising from the sands, the incredibly tall, meandering track of the Desperado roller coaster punctures the blue sky. What is a roller coaster doing in the middle of nowhere? And why is it in the middle of a casino? Search for Buffalo Bill's Resort & Casino rates at TripAdvisor. 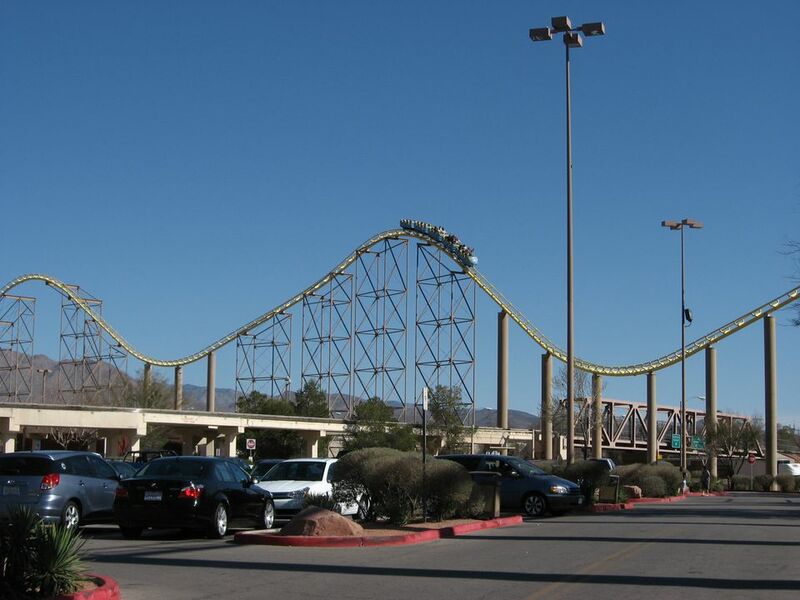 The Desperado is the centerpiece of the Primm Valley Casino Resorts in Primm, Nevada, about 45 minutes from Las Vegas. Gary Primm, the casino's founder, placed a Ferris wheel in front of his building in the early 80s to capture the attention of some of the millions of Vegas-bound travelers. With that modest move, he may have unknowingly sparked the trend to link theme park attractions with gambling. Encouraged by the hordes of curious folks who stopped to ride his wheel and gamble in his casino, Primm expanded on his successful formula. Today, the resort includes three hotel/casinos and enough attractions and rides to rival a small amusement park. A sleek monorail shuttles passengers over the interstate between two of the casinos. There's a carousel, skyride, freefall tower, huge arcades, a log flume ride, carnival games, motion simulation theaters, and more. Primm turned the middle of nowhere into somewhere. And it's the roller coaster that really put the place on the map. The Desperado coaster is unique in many ways. For one, the loading station is inside Buffalo Bill's casino. The electric-yellow steel track winds around and into the bustling casino. As nearby slot machines beep and burp out winnings, nervous riders wait in line fretting over the train of cars about to whisk them through the roof for a hair-raising journey. When it first opened, the Desperado had the official blessing of the Guiness Book of World Records as the world's tallest, fastest, and steepest roller coaster. It's since been eclipsed in all categories, but the heart-pounding, 225-foot first drop places it firmly in hypercoaster territory. With its steep decline, the Desperado clocks in at a top speed of 80 mph. Like most hypercoasters, the Desperado does not loop, invert, or otherwise tip its riders upside down. The mission here is to terrorize with sheer height and speed. The initial drop, which enters a disorienting lights-out tunnel at ground level, is certainly panic inducing, but not necessarily the most terrifying feature of the ride. As the coaster leaves the tunnel and climbs the second hill, it can provide a prolonged sense of negative-G weightlessness just before the cars are released for the second drop -- a dizzying 155-foot spiral fall. That strange feeling of weightlessness, repeated two more times before the third and fourth drops, can be especially powerful and disorienting. The weightless sensation, caused by negative Gs, is all the more frightening when contrasted with the intense positive G-forces imposed by the long and steep drops. When the Desperado first opened, it really poured on the butterflies-in-your-stomach airtime. It has not aged gracefully however, and the negative-G moments have been less intense more recently. Keep in mind that many variables can affect a coaster ride: temperature, lubrication, wear and tear on the coaster train, and time of day, to name a few. Your results may vary. There are more thrills to be had in and around the area. Check out other Las Vegas roller coasters.